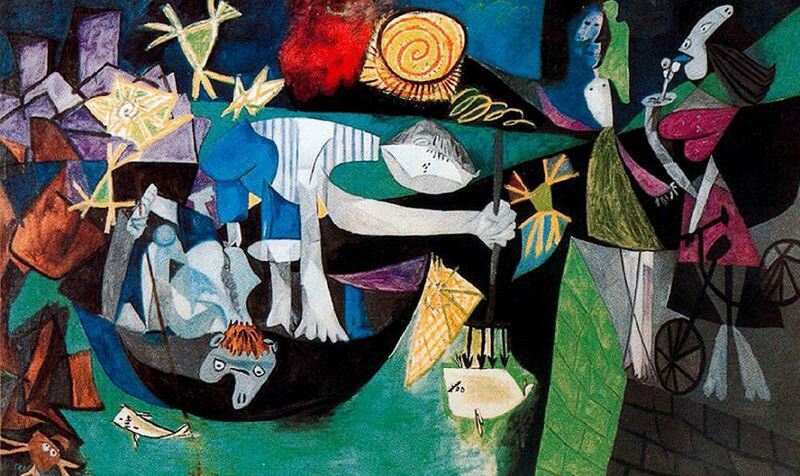 Picasso spent the months just before the outbreak of the Second World War at Antibcs on the Mediterranean. Here he painted this large composition, which is an exception among his works, as we shall see. At the center is a boat with two fishermen spearing fish by the light of two gas lamps. This central motif is framed by others: at the right we see two girls standing on the breakwater, one of the girls is holding onto her bicycle while licking an ice-cream cone. At the upper left we can recognize the old town of Antibes; in the center above there is a bright moon in the sky. The work displays a range of colors that has never before appeared in Picasso's paintings: dark blues and violets are contrasted with various shades of green, and this curious dark triad is brightened by a few yellow accents - which gives it a ghost-like quality. This painting is exceptional in Picasso's work, both as a nocturnal scene and for its ghostly colors; it is also unusual in that the artist had rarely before at-tempted to combine figure and landscape - a combination which is particularly convincing here. The freedom of the composition is in curious contrast with the rigorous architecture of Guernica, so that at first sight the work seems a brilliant improvisation. But closer scrutiny reveals that it, too, has been carefully constructed and organized, and that in its details it recalls many earlier paintings. Like Three Musicians, this work sums up and at the same time marks the end of a period. The painting was finished just as war broke out. Picasso had been through much the same experience in 1914 at Avignon. At that time all his friends and traveling companions had been mobilized, while he stayed in Paris. Now, however, Picasso was no longer a relatively obscure artist: he had gained universal recognition, and a comprehensive exhibition of his works was being held in New York. During the Spanish Civil War he had unequivocally declared himself against the powers that were now preparing to crush his second homeland. It is tempting to look upon Night Fishing at Antibes not only as the summing up of a period, but also as his farewell to it, and as a prophetic vision of the impending years of darkness. Picasso was scarcely surprised at the outbreak of the war - in his work he had long since anticipated the collapse of "the world of yesterday." During the years of oppression he became more than ever what he had always been - himself.